MUSAWA- The Palestinian Center for the Independence of the Judiciary and the Legal Profession obtained two copies of petitions filed with the Supreme Court of Justice by the lawyers, Anas Jamil Abdulrahim Gada’, from the village of Habla in Qalqilya Governorate, and Hasan Saadi Hasan Sawalme, from the village of Asira in Nablus Governorate. The petitions were against the appointment of magistrate judges under a presidential decree issued on 6/11/2018, whereas both petitions were based on the petitioners’ claim that they passed the magistrate judge’s recruitment competition with high scores, and that the presidential decree has recommended appointing a number of the competitors excluding the petitioners, who have previously passed the mentioned competition and were also excluded from the appointments, the thing that affects the equality and equal opportunities principle, in addition to affecting the legal status of the petitioners and depriving them from their right to employment according to the results of the competition. MUSAWA was informed that the plenum of the Supreme Court of Justice, which was formed for considering the two mentioned petitions, issued two preliminary draft resolutions that oblige the appellees to submit a plea within 15 days of the notification, if they perceive the contested decision in the two petitions as in full compliance with law and that there is no justification for canceling it. The context of the two petitions points out that the reason of exclusion might be due to the official bodies’ maintenance of the security, political and executive clearance procedures, to the contrary of the officially proclaimed decision on canceling them, as well as the Joint Security Committee that continues to exercise its powers normally despite the Prime Minister and Minister of the Interior’s announcement on dissolving it last year. MUSAWA- the Palestinian Center for the Independence of the Judiciary and the legal Profession renews its call that the Government and the competent bodies respect their resolutions on canceling the Security Clearance Procedure on grounds of unconstitutionality and as it violates human rights, prominent among which is the legitimate right of citizenship, equality before law, and access to public employment in accordance with the principle of equality of opportunity and without discrimination, and in accordance with the provision of the Basic Law and the Constitutional principles and the provisions of international covenants signed by the State of Palestine. MUSAWA also renews its call for identifying the legitimacy of the High Judicial Council's Composition, given that it continues to exercise its powers with eight members instead of nine, in violation of article 37 of the Judicial Authority Act, which could affect the legitimacy of its convening. 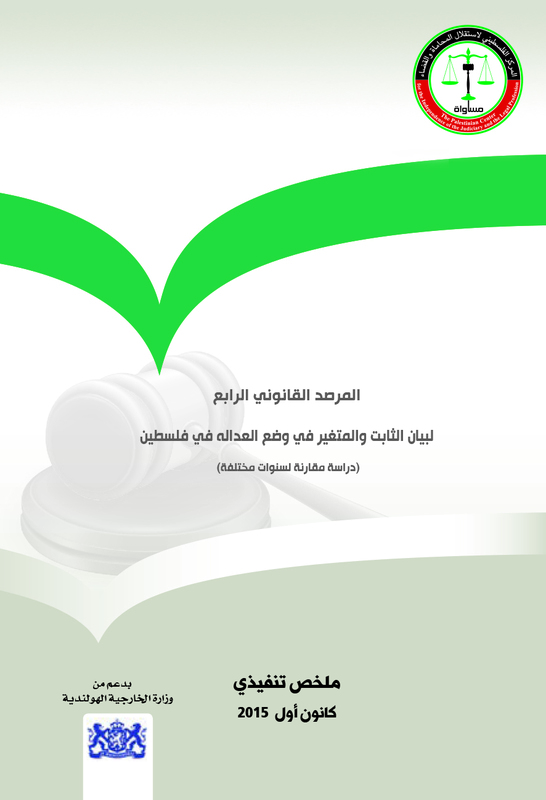 In addition, MUSAWA reiterates its request to publish the minutes of the High Judicial Council's meetings, especially the ones concerning placement for judicial employment and promotion, as it is considered a public right and guarantee of due process and a way for limiting the increasing phenomenon of pleads against placement decision issued in violation of the law by an unlawful council, noting that it is urgent to consider the result affecting the rights of the litigators and the stability of legal status of both the natural and legal persons as a result for the Imbalance in taking over the judicial office and the continuation of the implementation of Security, political, and executive clearance procedures, which contribute to undermining citizens’ trust in the justice system and its performance, the thing that would cause serious impact threatening the social and legal stability.